I play a war game called GoodGame Empire and have made some great friends there. Two of the best of the best of GGE are Ed and Zelda from the Dragon Rampant alliance. I recently changed alliances, leaving them behind when I moved. I will miss them a lot, they are good people and we will just have to IM each oner and stay in touch. Anyway, Ed loves nothing so much as a pork chop and talks about them the way poets talk about clouds. 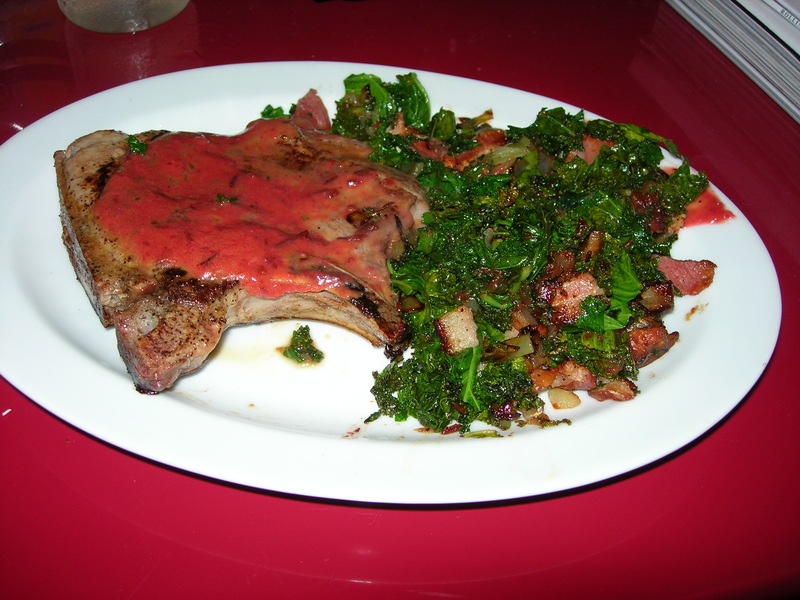 If there ever is an Ode to the Pork Chop, it’s author must be Ed. Zelda loves kale, something we bonded over . So my last night in the alliance I cooked up a meal in their honor. I fried the pork chop in a bit of olive oil, turning it once. My mom always said repeated flipping of your chops or steaks will dry them out and so my main focus in cooking a chop is getting a good sear, flipping it over to sear the other side and then turning the heat down a bit to let it cook through enough. I like them medium rare which reminds me to suggest you read The Complex Origins of Food Safety Rules — Yes, You Are Overcooking Your Food from Scientific American. The kale was easy. I took two slices of bacon and cut into small pieces and friend them with 1/2 of a small yellow onion. I cleaned three pieces of kale, cutting them off the stem and chopping them up. I added 2 TBSP of the Wild Plum Sauce I made (the recipe just before this one) when the kale was nearly done, covered for about a minute and served with the chop. 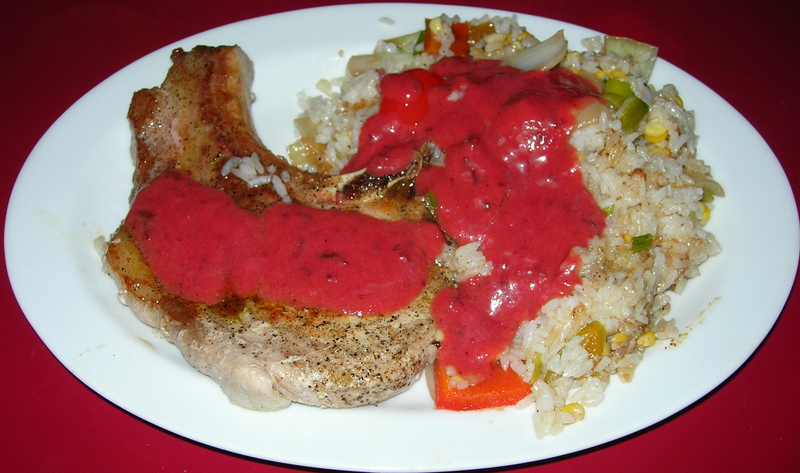 I added a bit of Wild Plum Sauce on top of the pork chop, too. Delish. The wild plum sauce is sour enough – like a vinaigrette that it complemented the kale beautifully. As to the pork chop, I could never do it the justice in words that Ed can.